May the peace of the Lord Christ go with you: wherever He may send you; may He guide you through the wilderness: protect you through the storm; may He bring you home rejoicing: at the wonders He has shown you; may He bring you home rejoicing: once again to our doors. ancient prayers, responsive readings, those things that bring the ancient into the modern. i’m always trying to find ways to weave those moments into services. 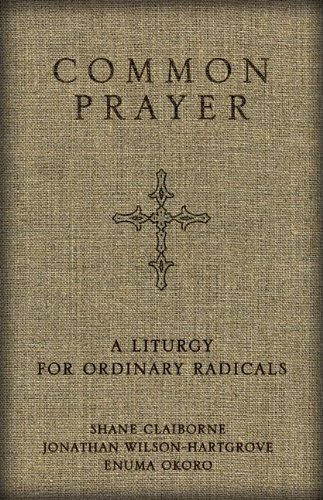 i picked up Common Prayer: A Liturgy for Ordinary Radicals yesterday. it’s one of those books you know will be precious to you as you hold the texture of the linen cover in your hand. I wanted to share 3 passages from the prayers for today. May the peace of the Lord Christ go with you: wherever he may send you; may he guide you through the wilderness: protect you through the storm; may he bring you home rejoicing: at the wonders he has shown you; may he bring you home rejoicing once again into our doors.